Is it time for education to embrace entropy? I found this fascinating and began to think about how entropy relates to learning and education. 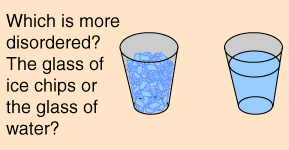 It seems to me that many of us, involved in education, are constantly fighting against the arrow of time seeking to create ordered systems (ice cubes) with low amounts of entropy. However, the science would suggest that structures with low degrees of entropy are unsustainable; that they will eventually reach a higher state of entropy (water) over time. If this is the case, would we not be better off embracing a less structured system of education, one in which there is a high level of entropy already. The way that I learn now (as an adult) through multiple feeds and sources of information is far less structured than the 5 lessons per day, two homework per night model that I experienced in school. I would argue that it is far more richer as the widening of sources of information are changeable and in some senses exponential. If this is, as I suspect it is for many others, the natural model of education after school then why not make it the method of education during school years? The problem with a system of education that has a high level of entropy would be accountability. However, this is where I believe education, today, has gone wrong, particularly in the UK. We could embrace a less structured system of education if accountability rested with the learner rather than the educator. League tables and Ofsted force rigidity and structure upon us leading to spoon feeding, content driven curricula and mediocrity for many learners. If the accountability was with the learner, there would inevitably be an increase in failure (in academic terms) but I believe there would also be a significant increase in engagement and success. If we gave students, along with the accountability, the freedom and responsibility to define their own curriculum, their own learning paths, I believe they would flourish. For this to work it would require many different learning models, sources and structures. The entropy would be high but arguably more sustainable and increasingly more likely to bear fruit. Why? Because it acknowledges the arrow of time and embraces change rather than continuing to try to shore up an antiquated education system; stuck in the past. What do you think? Is it time for education to embrace entropy? Posted on Thursday, 21 April 2011 Sunday, 4 May 2014 Categories EducationTags arrow of time, disorder, education, entropy, learning, universe, wonders12 Comments on Is it time for education to embrace entropy?